Season five of AMC’s “Mad Men” is underway, exploring the summer of 1965. We’ve seen Sally Draper lounging at her new step-dad’s house, and Megan has nagged Don to spend a day on Fire Island with her friends. I started thinking, what if Don, Meghan and the kids hit Florida for an all-American road trip during the summer of 1965? In the ’50’s and ’60’s Florida was as popular for vacations as it is today. Even before Disney World, Sea World and Busch Gardens, Florida had dozens of beautiful, natural attractions and quirky offbeat sites for tourists to enjoy. Because the state was less homogenous, a road trip through Florida was more exciting then. Each region had something unique to offer. Here’s another dance party! You’ll need a free Spotify.com account to check out these tunes. Listen to the entire playlist, or each track individually below. Recently, I’ve wondered if we’ve somehow entered a time warp. Even though the calendar says 2012, many of the headlines I’ve been reading and many of the conversations I’ve been hearing could have taken place in 1962. For example, are we really debating birth control in 2012? One would think the Pill had just been introduced. What about Cuba? Fifty years later and the island is still a political hot potato, even though not many Cubans on the island have potatoes to heat. Here’s a soundtrack for the chapter for October 19, 1962. You can listen to the entire playlist here, or click the individual tracks below. Remember, you’ll need a free Spotify.com account to listen to these tracks! 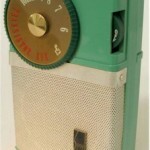 In 1962 radio played a big part in everyone’s life. While television was garnering a big audience share and sales of TV sets were booming, radio remained an important tool of communication. Televisions were costly and large, even the portable.